With this explorable you can discover a variety of spatio-temporal patterns that can be generated with a very famous and simple autocatalytic reaction diffusion system known as the Gray-Scott model. In the model two substances \(U\) and \(V\) interact and diffuse in a two-dimensional container. Although only two types of simple reactions occur, the system generates a wealth of different stable and dynamic spatio-temporal patterns depending on system parameters. This explorable illustrates a dynamic model for pattern formation in a growing community of microbes. Many microbial organisms exhibit collective behavior when a community of them expands say on a surface with nutrients. These patterns are often very beautiful and rich in structure. This explorable illustrates the dynamics of a self-organizing map (SOM), specifically a neural network known as the Kohonen Map. The Kohonen map is a model for self-organization of biological neural networks and how the brain can learn to map signals from an input space, e.g. visual stimuli in the visual field, to a two dimensional layer of neurons, e.g. the visual cortex in the brain, in such a way that neighborhood properties in the stimulus space are conserved as best as possible: Neurons that are neighbors in the neural network should respond to stimuli that are also close in stimulus space. This explorable is about pattern formation in a model system for the growth of a bacterial population in a petri dish in which the bacterial population is made up of a mix of two or three mutant strains that have identical fitness and reproduction properties. In the model system, an initially well mixed drop of bacteria with an equal amounts of every mutant strain is positioned in the center of the petri dish. After that, the bacteria start replicating, the population expands radially and a pattern will emerge. This explorable illustrates an evolutionary process in an "ecosystem" of interacting species (cartoon maggots, in this case). Individuals move around in their enviroment, replicate and eat each other. Optionally, mutations can generate new species. The system is similar to the Explorable A Patchwork Darwinge, only a bit more animalistc and dynamically slightly different. However, for this one here, you need a bit more patience in order to observe interesting effects. This explorable illustrates how a school of fish can collectively find an optimal location, e.g. a dark, unexposed region in their environment simply by light-dependent speed control. The explorable is based on the model discussed in Flock'n Roll, which you may want to explore first. This explorable illustrates the dynamics of a predator-prey model on a hexagonal lattice. In the model a prey species reproduces spontaneously but is also food to the predator species. The predator requires the prey for reproduction. The system is an example of an activator-inhibitor system, in which two dynamical entities interact in such a way that the activator (in this case the prey) activates the inhibitor (the predator) that in turn down-regulates the activator in a feedback loop. Activator-inhibitor systems often exhibit oscillatory behavior, like the famous Lotka-Volterra System, a paradigmatic model for predator prey dynamics. 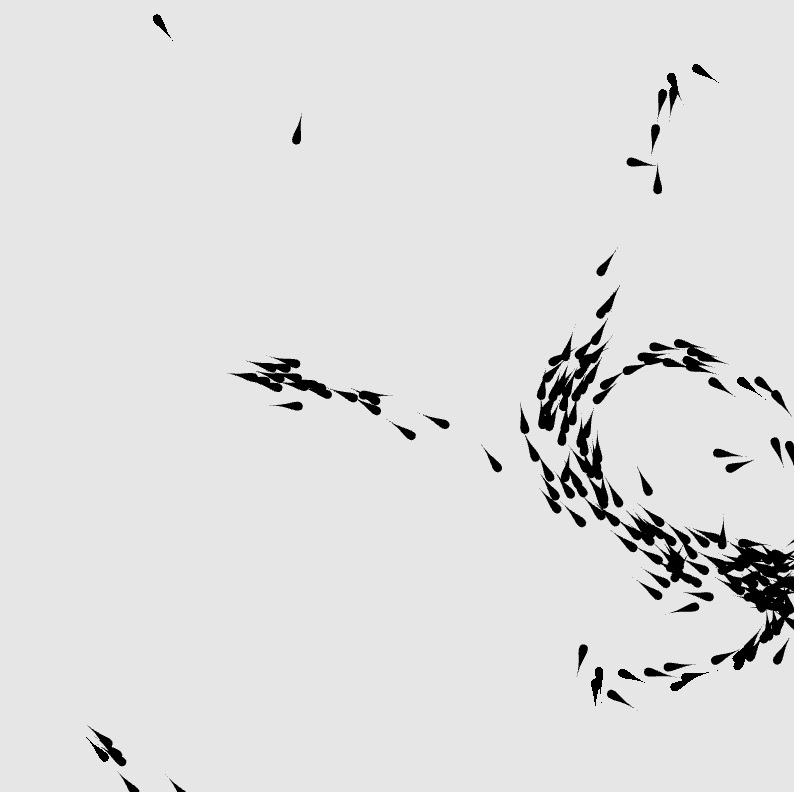 This explorable illustrates of an intuitive dynamic model for collective motion (swarming) in animal groups. The model can be used to describe collective behavior observed in schooling fish or flocking birds, for example. The details of the model are described in a 2002 paper by Iain Couzin and colleagues. This explorable illustrates some interesting and beautiful properties of oscillators that are spatially arranged on a lattice and interact with their neighbors. This explorable illustrates how fractal patterns observed in natural systems, particularly structural properties of some plants, can approximately be modeled by simple iterative models. Sometimes these models are refered to as Lindenmayer systems.